On a whim and with two hours to spare, I took a flyer out to Windsor a couple of months ago and managed to ride to the Great Park shortly before night closed in. The speed limit sign at the entrance is a familiar sight, but seeing it at an unusual time of day when there are more families ambling along the pathways made it look even more inappropriate. So I took a photo to remind me of its daftness. Why is the speed limit so high for roads that are essentially paths for pedestrians and cyclists? And why not a nice, round number? Even a habitual speedometer-watcher like myself would struggle to keep the needle lodged a few degrees south of 40. I can’t answer the first question but I do know the answer to the second. Decades ago, there was a plan to convert British road signs to metric, which would have meant displaying the basic speed limit as 60kph. 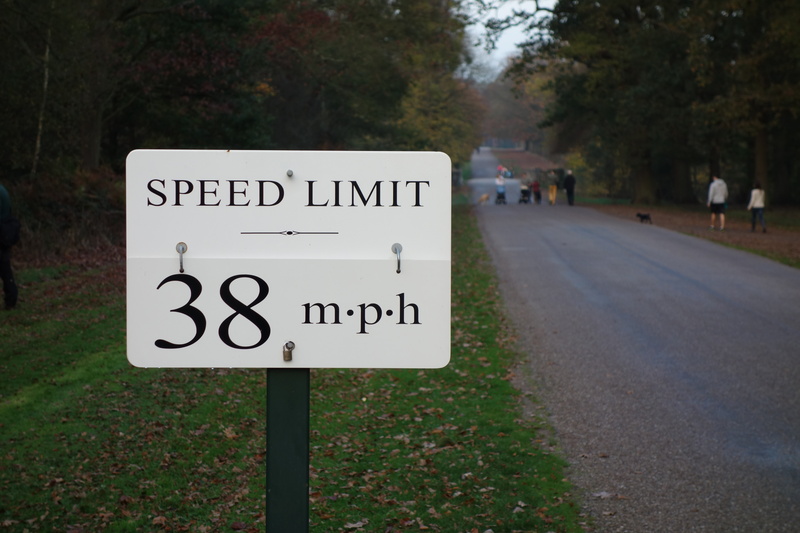 Anticipating the switch, the Crown Estate put up signs in the park reading 38mph because that’s the equivalent of 60kph. Except it isn’t: 37mph is roughly 60kph; 38mph is actually 61kph. The body tasked with maintaining order in the park is asking its users to slightly exceed a mooted speed limit which never actually arrived. You have to admire the Crown Estate. The number is wrong and so is the principle of using a path as a road, but like a politician caught in the glare of commonsense who refuses to admit a policy is dunderheaded or ill-thought-out, the speed limit defiantly remains at 38mph. Those signs could be swapped for useful ones to warn that groups of cyclists must not exceed six people, which is what Windsor’s parkies have told London Dynamo members in the past, but that would be far too sensible. Best to keep them as they are and hope that one day the government will once again want to display speed limits in metric form (which is what will soon happen to height restrictions on roads). Even a stopped clock is right twice. This entry was posted on	December 16, 2014 at 12:55 pm	and is filed under Uncategorized.